This is Meligy from gurustop.net/newsletter, the AngularJS and web development newsletter. It has been quite a while since I wrote to you, and if you have been subscribed in the last month or so, this is probably the first time you read from me (previous letters). It was supposed to come in ng-conf a couple of months ago with a conservative plan announced in January, but the AngularJS team chose to polish it more and just had it ready. They have a very good summary of what they added/moved in this blog post. They also added a separate migration document you should check for breaking changes. A good tip about leaky abstractions. $http methods act like promises everywhere, except when you use their special methods. If you call these inside a service or so, the consumer needs to check whether you return a regular promise or an http promise to check whether to use success(). Why not just treat it like any other promise! That’s not a PluralSight course on anything, just a free webinar available on YouTube. Have a look! A very good deep dive into how DI works in Angular 2. It even shows you how to use the dependency injection framework on its own regardless of the rest of AngularJS. Just in case you didn’t hear that the Angular team wants Angular 2 to run in NativeScript (which allows JS to work natively, and is associated with ReactJS typically today). This is their meeting notes document. If I remember right, the other meeting notes documents from Angular team often keep the most recent meetings at the beginning. This one doesn’t, so the most recent meeting is at the end of the document. According to this article (the website is one of the best resources for SEO by the way), it’s mostly very impressive. You’ll still need to remember that Google is the BIGGEST but not the only crawler that might visit your site though. Polymer is Google’s framework for building independent web components (think widgets, like jQuery plug-ins or social sharing widgets, etc) that can be injecting into any website without conflicting with other content on the page. It also aims to build a big reusable component library ready for anyone to use. While Polymer has a few similar features to AngularJS, notably data binding, it intends to be a widget framework not a whole application framework. It doesn’t offer things like routing, dependency injection, forms management, etc. A few members of both teams said that Polymer and Angular do not have plans for merging or discontinuing one framework in favor of the other. Angular 2 aims to be able to work with any web component whether built with Polymer or not. A new article and video series about frontend tooling from Google Developers network. The first episode is about using SublimeText for frontend, so, it’s very practical and pretty useful. You probably heard about Visual Studio Code already. It’s Microsoft’s SublimeText-like editor, just like Github’s own Atom editor. Actually, the word in the street is that VS Code is a fork of Atom. Why would Microsoft do that? This doesn’t add anything, does it? It probably sounds silly to you and not worth investigating. This is why I talk about it in here. I read all these thoughts then went and watched the video at the top of the Visual Studio Code homepage and it answered them all. There are a lot of editing and -even more- debugging experiences that are pretty inspired from the full Visual Studio. Adding these to a Sublime/Atom like editor is an awesome plus. The features -especially debugging- are more complete for NodeJS than ASP.NET 5 (v. Next) BTW, which is funny, but at least we can be sure more ASP.NET 5 love is definitely coming. If you are interested in VS Code, check out Johan Papa’s blog as well. He is blogging about it actively nowadays (and about ASP.NET 5 on Mac as well). And for one or two who haven’t heard yet, you can actually get the full Visual Studio Professional edition for free as the Visual Studio Community Edition (yes, exactly as Pro) if you are alone or in a team or 5 people or less. This blog post is based on a very interesting extension Visual Studio 2015 RC Tools for Docker. The extension adds itself to the Visual Studio publish dialog seamlessly and seems to integrate very well. If you are learning ES6 and sharpening your teeth, it might help to have an extension that lets you run ES6 in the console like you do with ES5 today! This extension makes you monitor / log all DOM changes, like added/removed elements, attribute changes, text changes, all. It’s pretty magical. Although I admit, being a new tool that’s not already in my workflow, I just installed it a while ago, tested it with much wonder, then forgot about it until I checked my bookmarks for this newsletter. I guess I’ll be using it a bit more going forwards again! Collections of resources for learning. You’ll want to skim over the list and decide if you find anything interesting. I mention the whole collection as I find so many interesting. The guy talked to the author of the list to prioritize the most important resources, then checked them on his own and wrote a summary of each in his forked list. He wanted to make sure he is not a parrot, recommending what he didn’t understand himself. Check it out for the resources part especially not the libraries or so list. I could find pretty interesting learning links, and pretty basic / overly-obvious library links (like: react!). This site calls itself a social network or a forum, however, the value I see in it is a whole lot of videos in so many topics. The ones I checked for JS and MongoDB were recent and good. The site has a lot of categories to check though. That was it for this email. I’ll keep collecting resources and sharing them with you as I go. If you like them, share the love with your friends and tell them about the newsletter. If you don’t like where I’m going with this, just email me or reply to this email, and let me know what can be made better. Also, if you found some good article or tool that is a good fit for the ~600 web developers reading this newsletter, email / reply, or tweet it at me and I’ll have a look (and credit you of course). Soon after Windows Server 2012 has been released, I was wondering when hosting providers will start providing it, talking to the hosting provider that hosts this very blog, SoftSys Hosting, they told me that they already have Windows Server 2012 hosting plans, bother for Virtual Server (VPS) or dedicated servers. I’ve been their happy customer since 2009 or before, so, I can confidently recommend them for anyone willing to have a Windows 2012 server soon. They’re generally in the economical category (so, great cost), but I have tried others in this category before and the others all were useless for anything serious, with SoftSys Hosting on the other hand, their VPS performance, general network speed, and support responsiveness all are of a premium class. As usual Python stuff for .NET is more advanced and evolving quicker than Ruby stuff. Sad fact to me as (syntax-wise), I like Ruby much more! I haven’t tried yet but what they claim for IDE features specifically is really impressive (if works as in screenshots). They also support multiple Python runtimes/environments (CPython, different versions of IronPython, PyPy). Get it through your school: You might already have a license for VS – please contact your sys admin or professor. OK, instead of much talk, let me quote you the email that says all 1-day deals by SitePoint in last 23 days are available today. I’m not sure of the time zone for “today”, so, ne quick! You know all those cool deals you missed? Don’t despair! you missed out on while saving up to 90%! individually. This means we’re unable to combine shipping costs. However, the prices are so low, you’ll still be saving bucket loads. Thank you for participating in our Christmas Countdown! as we’ve enjoyed sharing them with you. Go and pick the offer that sounds good for you. Do not worry about the "X" on each. Thanks Scott Hanselman (@SHanselman) for spreading on twitter, hence getting me to know about the book! jQuery is a very powerful library. One of the first things I do when creating new project is to include the library in it. Microsoft is going to include it by default in ASP.NET web projects (All ASP.Net projects, not just MVC) starting Visual Studio 2010. The guesses (by me and others) look like they were on target. The “Orchard Project,” which is getting its debut on November 11 at Tech Ed Europe is, indeed, the successor to the Microsoft Oxite content-management system (CMS). Microsoft made available the first the open-source Oxite CMS bits at the end of 2008. Like Oxite, Orchard will be a free, open-source CMS platform — plus a set of shared components for building ASP.Net applications and extensions. The Orchard code is licensed under an OSI-approved New BSD license. The Orchard team includes various ASP.Net developers; two of the principal developers of Oxite, Erik Porter and Nathan Heskew; and Louis DeJardin, the creator of the SparkViewEngine for Model View Controller (MVC). There is no public timetable (so far) for when a test build of Orchard will be out or when a final version will be released. Mary Jo has covered the tech industry for more than 20 years. Don’t miss a single post. Subscribe via Email or RSS. You can also follow Mary Jo on Twitter. Orchard is a free, open source, community-focused project aimed at delivering applications and reusable components on the ASP.NET platform. It will create shared components for building ASP.NET applications and extensions, and specific applications that leverage these components to meet the needs of end-users, scripters, and developers. Additionally, we seek to create partnerships with existing application authors to help them achieve their goals. Orchard is licensed under a New BSD license, which is approved by the OSI. In the near term, the Orchard project is focused on delivering a .NET-based CMS application that will allow users to rapidly create content-driven Websites, and an extensibility framework that will allow developers and customizers to provide additional functionality through extensions and themes. Orchard is currently in the initial stage of development. We have chosen to launch the project at this stage in order to invite early participation by the developer community in shaping the project’s direction, and so that we can publicly validate our designs and development approach. Some of the initial source code and specs are available for review and comment but there is no downloadable release at this time. We encourage interested developers to check out the source code on this site and get involved with the project in these early stages. The Orchard team is a small group of developers at Microsoft who are passionate about delivering open source solutions on .NET technology. This team is releasing the project on its own; Orchard is not a Microsoft project. The team is primarily composed of ASP.NET developers and has recently grown with the addition of two of the principal developers on Oxite, Erik Porter and Nathan Heskew, as well as Louis DeJardin, a long-time ASP.NET developer, community software advocate, and creator of the SparkViewEngine for MVC. Together this core team will use their experience working with ASP.NET and Oxite to deliver a fundamentally new architecture that is the Orchard CMS. We have deliberately chosen to start development, with the guidance and contribution from the community. Over time we expect this project to become a viable successor to Oxite v1 and we know that providing a migration path for users of that existing application will be a high priority. We are working to define our contribution model, so stay tuned for information about how you can contribute and join the project team. We hope that by engaging with the community in the very early stages of the project that we will be able to shape Orchard into a valuable set of tools and applications for the community. The Orchard team is committed to open community participation and is in the process of working through the details to be able to accept code contributions. We encourage community participation at all levels from general project feedback to bug fixes and patches. Microsoft has released a new Facebook SDK Version 3.0 (other than their old not-so-great one) and it looks to have not just updated APIs but also wide range of features supported in many application types. Microsoft on Monday released a software development kit for Facebook that allows developers to create Facebook applications for Silverlight and Windows Presentation Foundation. This should expand the reach of Facebook in third-party applications as well as make Silverlight and WPF more viable platforms for developers looking to build social applications. A screenshot showing off the NewsFeed control for WPF. The SDK comes complete with samples and tools to develop Facebook applications in ASP.NET, Silverlight, WPF, and WinForms. It also features the source code for the API, components, controls, and samples. Microsoft, as you may remember, invested $240 million in Facebook back in October 2007. Many called this move more of a strategic play to keep Google and Yahoo from getting a stake in the company. The release of this SDK is a part of Facebook and Microsoft’s ongoing partnership. If you’re interested in taking a look, you can download the SDK here. To get started we recommend you download the SDK and refer to the "How to" guides and the Facebook Developer Wiki to get familiar with these new resources. Refer to the detailed instructions on the Facebook Developer Wiki. Here are some important links to use as a starting point. The website, as the name implies, is dedicated for ARABIC resources related to SharePoint. It originally contained the technical blogs of the site founders (Founders’ Blogs) which are very useful for posts about SharePoint, then very recently they have also lunched Screencasts (Also in Arabic) that start from the very beginning until further advanced stuff. I think you’ll enjoy them! 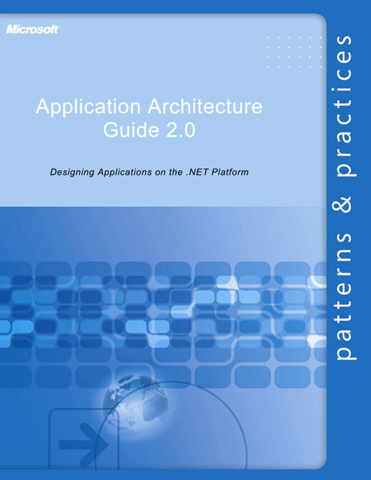 Microsoft has released a final version of its book “Microsoft Application Architecture Guide, 2nd Edition”. This guide is available online here in the MSDN Library and will be available in the Fall of 2009 as a Microsoft Press book, ISBN# 9780735627109, that you can purchase through local and online booksellers. The guide is intended to help developers and solution architects design and build effective, high quality applications using the Microsoft platform and the .NET Framework more quickly and with less risk; it provides guidance for using architecture principles, design principles, and patterns that are tried and trusted. The guidance is presented in sections that correspond to major architecture and design focus points. It is designed to be used as a reference resource or to be read from beginning to end.